JavaFX Script makes it easy for developers to quickly develop high-quality UI-intensive applications very quickly. 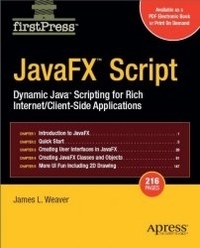 As JavaFX Script: Dynamic Java Scripting for Rich Internet/Client-side Applications demonstrates, developers can develop Rich Internet Applications and rich client-side user interfaces quickly and easily with this potential replacement for Ajax and perhaps even ActionScript and other scripting found in Flash. This book is for content developers and application developers with some programming experience who want to create rich internet applications.